In what became a blueprint for many other aquariums around the world, Monterey Bay Aquarium was designed by San Francisco-based architectural firm EHDD “to focus on the unique marine ecology of one habitat: the Monterey Bay and its shoreline.” Since 1984, the Aquarium has enjoyed an intimate relationship with the land and water over which it was built – literally participating in the natural ecosystem it showcases – pumping in unfiltered seawater that fills some of its exhibit tanks, as one example. In 2016, the American Institute of Architects (AIA) bestowed its coveted Twenty-Five Year Award to the Aquarium. 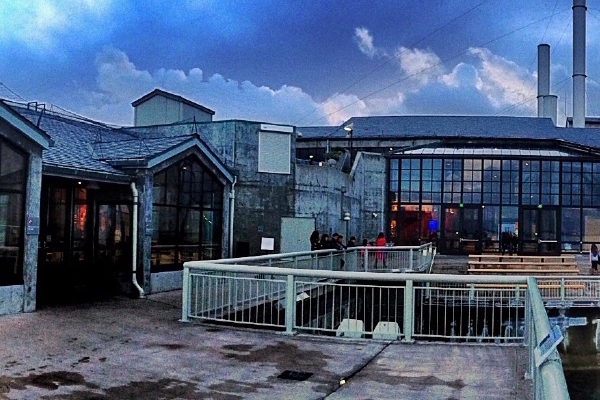 Each year, the award recognizes a precedent-setting “project that has stood the test of time for 25–35 years and continues to set standards of excellence for its architectural design and significance.” Comments from the awards jury included, “a brilliant, gritty adaptive reuse and still at the forefront of interactive museum space” and “a benchmark and role model for aquariums everywhere.” In 2002 (Ellison job #9554), the Aquarium installed two pairs of Ellison Bronze custom balanced doors made of extruded aluminum, painted black, with stainless steel tie rod construction and panic exit devices. 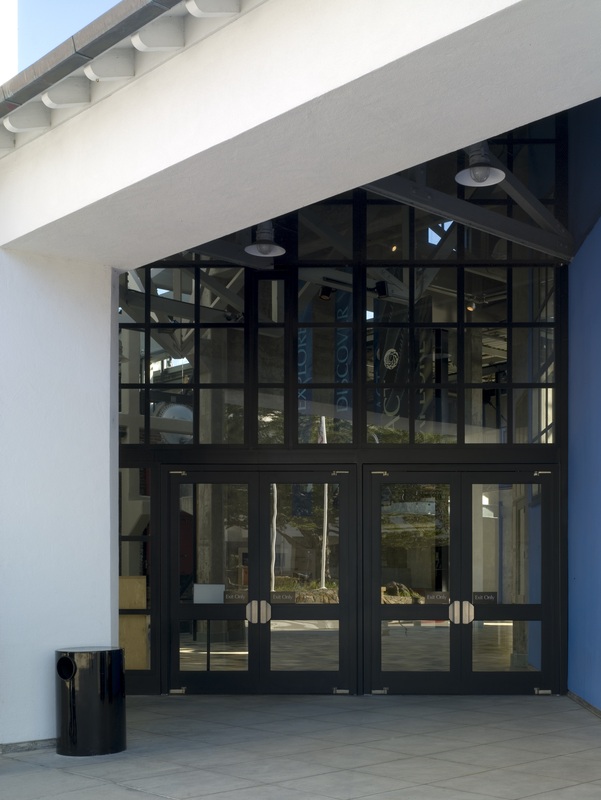 In 2004 (Ellison job #9748), the Aquarium subsequently installed an additional three pairs and three single Ellison Bronze custom balanced doors, also made of aluminum and painted black, with stainless steel tie rod construction and panic exit devices. 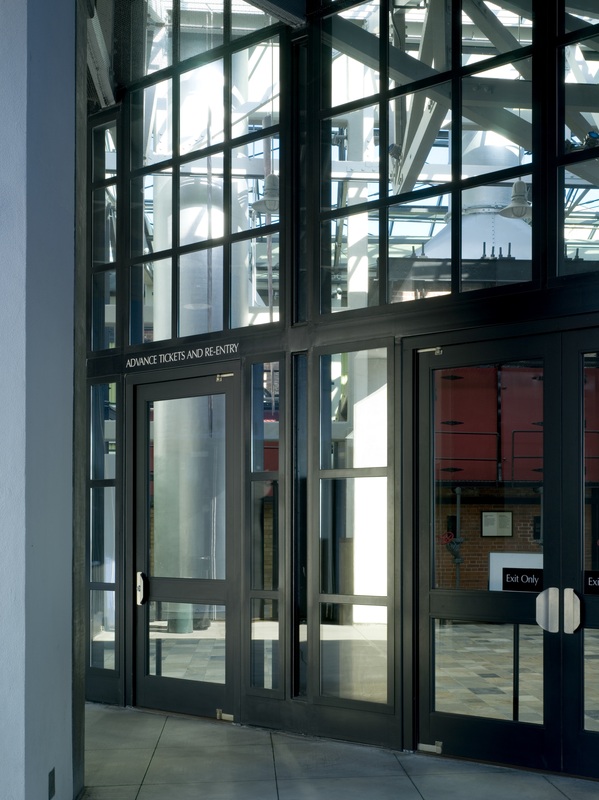 As with countless other prestigious projects in its 100+ year history – including the San Francisco Exploratorium, another waterfront project – Ellison Bronze, based in Falconer, NY, creates doors that achieve the highest standards for aesthetics, functionality and durability. This includes the ability to withstand heavy trafic. 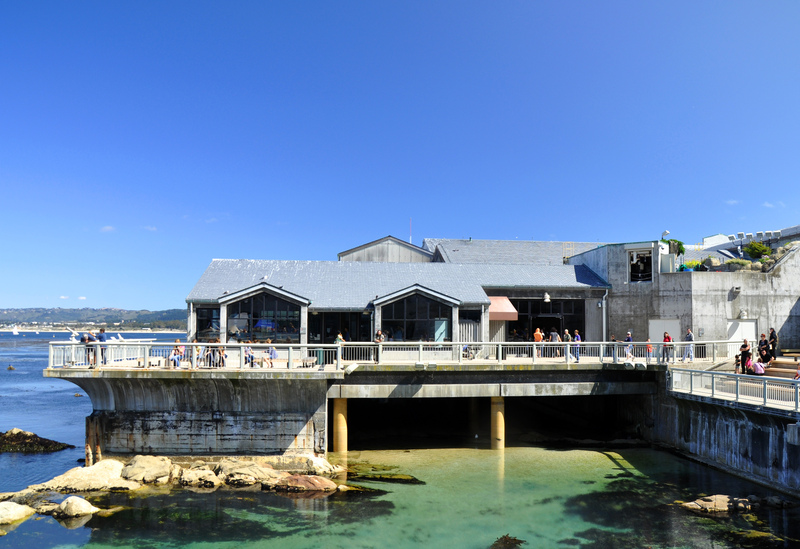 During its peak season, Monterey Bay Aquarium receives as many as 12,000 visitors a day! Unlike conventional entry doors, an Ellison aluminum door is constructed from heavy wall extrusions that are made solely for Ellison and specifically designed to work in conjunction with their balanced hardware system. The door leaf’s horizontal top and bottom rails are attached to the vertical stiles using both welded and bolted connections with additional stainless steel tie rods at horizontal rails, yielding an extremely durable and long lasting entrance. While Ellison balanced doors consist of heavy and robust components, they can still be opened with ease. A balanced door features an inset pivot point at two-thirds the width of the door, creating a balance that distributes the weight so the door requires little force to open. The inset balancing point allows for an easier open force, even against external wind and internal building pressures. Ellison provides detailed record keeping and full warranties – important when considering the extensive lifespan of an Ellison door. Every door made is imprinted with an individual project number (similar to that of a car’s VIN number) to facilitate easy tracking and maintenance. Furthermore, all Ellison balanced hardware components are machined in-house, which means that replacement components are always readily available. The architectural firm, EHDD, is proud of the Monterey Bay Aquarium project and recently posted this comment on its website: The Aquarium was built on the site of a former sardine cannery on the famed Cannery Row, from which one of John Steinbeck’s novels takes its name.